This paper explains how estate land and property is successfully managed throughout the life of a major construction project. It will briefly touch on the control measures used to track, record and account for a change of contract activity over a large footprint in excess of 5 million square metres. It will summarise how custodianship is updated and presented to ensure every square metre is captured and controlled and clarify the basic principles of estates management akin to major construction activity and what precautions, provisions and budget items should be included. This paper is designed to help those engaged on major construction projects with a large array of varied contractor activity over several phases of operation. On possession of land and property the new owner immediately assumes a number of legal obligations and a duty of care. Some examples include; security, protection against trespass, occupiers’ health, safety, statutory testing, environmental compliance, utility and occupational payments, maintenance and a host of unpredictable cost implications. Often new owners will seek to transfer their obligations onto a third party where practicable but this is not always possible. This paper is an illustration of how planned and controlled occupancy is designed to help mitigate risk and transfer accountability to the project construction team where possible. Crossrail put in place contracts, processes and systems to deliver key estate services designed to support and avoid risk on this major construction project. Before any work can commence the project must first have the land on which to build. Where consultation has been ongoing years in advance, some property owners may allow their estate to slip into disrepair. In Crossrail’s experience this resulted in some properties being squatted, infested, run down and/or dangerous presenting a risk at possession. To keep pace with a dynamic acquisition programme it is important to ensure main works contractors are immediately aligned and appointed to take over the land on the compulsory purchase dates specified. However on a programme with multiple sites some contractors may not be appointed in time to take possession and secure. To mitigate the risk of not having an available contractor, the Estates team procured a total facilities management (TFM) contractor on a call-off contract. By appointing a contractor with a wide capability, Estates could provide a variety of interim protection and maintenance until the main works contractor was appointed. The Estates TFM contract was designed to cater for a wide range of hard services capable of supplying all trade skills and services to support the wider project as necessary. This appointment has been a success spanning a variety of services from security to sourcing hotels for residents in noisy areas and from repairing settlement damage to temporarily maintaining completed assets before opening to the public. With circa £900m of acquired land, it is essential to know who has what and where. To simultaneously and successfully manage the custodianship of over 5 million square metres, several hundred work areas and dozens of contractors it is important to record each transfer between one party and another throughout the project. 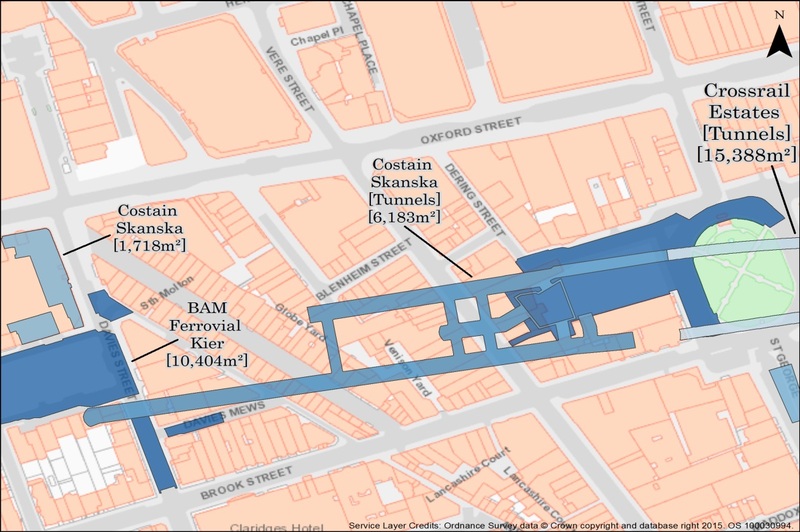 Figure 1 below identifies how each custodian area is recorded and demonstrated in CAD and GIS identifying where each contractor is responsible. To manage land exchange a rigorous handover and handback certification process was established to ensure Estates were the recipient signatory before any land could exchange hands. It’s essential to have senior director approval to support and endorse this process as a single control measure. This will prevent others at each site coming up with their own plans where asset land data and control is easily lost. 1) Handover (HO) – Used when taking land and property from each owner and/or occupier for the very first time when taking possession. Estates receive, sign for and then immediately sign over to another as the new custodian. 2) Handback (HB) – Used when receiving the land back from the occupying party (custodian) leaving, which is normally a contractor. Here Estates again sign to receive back the land and in turn then immediately transfer it to the new incoming party. There maybe several HBs on one piece of land over the time of the project where one phase completes making way for another. 3) Final Handback (FHB) – This is where on full completion of all works the land is finally handed back to CRL Estates to formally receive and then sign over to the final end user. For example a FHB certificate is used to transfer the final land asset to new infrastructure owners/operators or where temporary land used on completion is finally returned back to its original owner. All HO, HB and FHB certificates have their own ID reference code and an accompanying site plan to reflect the area or changes made in it. All details are then transferred onto CAD and GIS. The EMS is a computerised database used to record, track and report on key estate management activities. 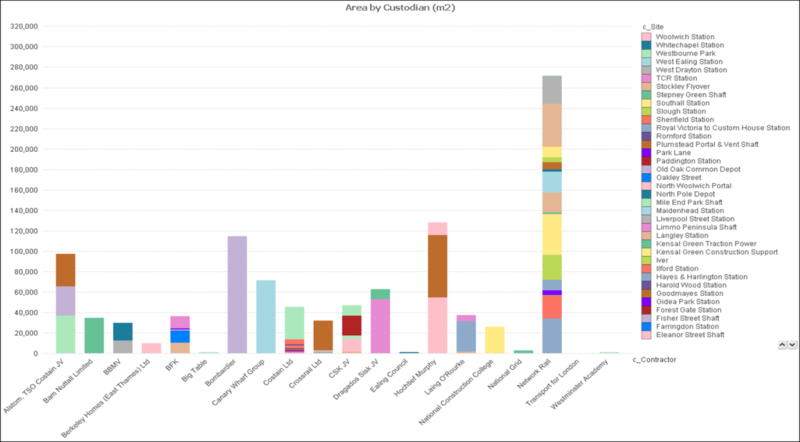 All HO, HB and FHB activity is logged into EMS which using Qlikview generates a series of dashboard reports identifying who occupies what, where and when. See Figure 2 chart below. The CAD team update and digitise any new HO, HB or FHB area plans as they take place denoting who is the new custodian. This automatically updates the CAD master data model which is published to GIS and displayed in Crossrail Maps. Crossrail Maps is a bespoke web GIS application based on ESRI software which provides the user with holistic views of all estate activities. The user can access a host of these analytical features such as measurement tools, multiple layers, various base maps, Google street view and print functionality to name a few. The Estates team are all equipped with iPads for mobile data collection and on site queries. 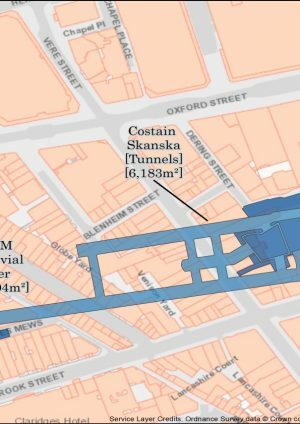 Data is automatically linked to Crossrail Maps providing a useful tool where the Estates team on site can easily digitise and check an area they are concerned about. Here they can detail GPS coordinates and interrogate later back at the office. Figure 3 below is an example where Estate land surveyors have re-tracked physically the current status on site and have re-mapped the live model over that formally taken through the Act several years earlier. 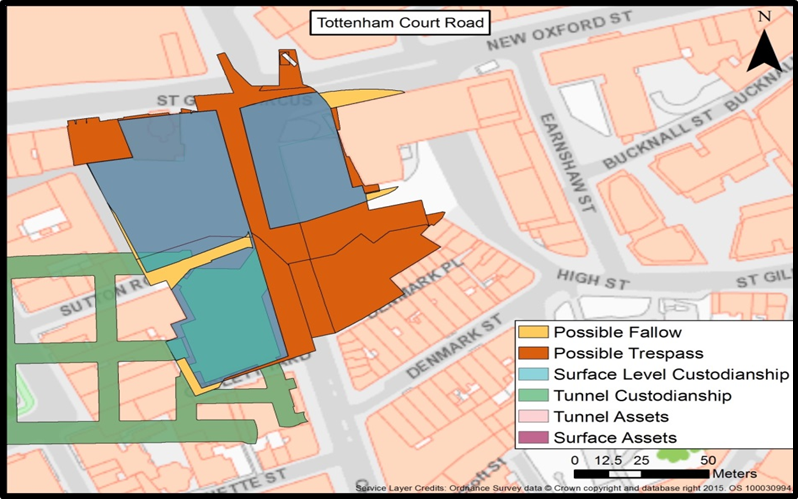 By overlaying actual occupation and custodianship layers against the formal land acquisition plans we are able to see where Crossrail may be at risk where occupation may have reduced exposing unprotected land known as “Fallow”, or alternatively, where the contractor may have expanded beyond their allocated land, known as “Trespass”. On each occasion Estates work closely with the project team to re-calibrate the drawings to correct error or help take practical measures to realign fences and re-identification of custodianship ownership especially where highways or shared use is concerned. In addition to managing an average of 4 to 5 land exchanges per week, it is important to have a team of property professionals available to manage and administer everyday estate items. Commercial – Dealing with business rates, rent and licence fees. Ensure you have an approved Estates Management Plan. Ensure you have a comprehensive HO, HB and FHB schedule linked to the programme from which to work. Firmly control the administration of all HO, HB and FHB documentation across the project as a single source of truth to avoid others developing their own scheme and in doing so jeopardising the asset management record process. At the outset ensure there is more general estate security included in the main tender works documentation to start in advance of cooling off periods. Work with legal team procuring to ensure this included in the tender bid with the main works contractor so they have a clear obligation and cost rate to provide interim cover in advance. 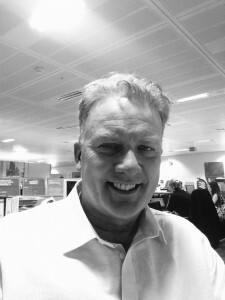 Work closely with own Director and other department Directors or those at senior level to achieve endorsement of Estates processes and use senior staff to communicate these to get across the importance of estates and its core purpose to manage, support, mitigate corporate risk and account for land use. Advise accounts department that periodic spending in estates is varied and not equally proportioned. Have a wide range of estate skills where required. Ensure any supporting works for third parties are only undertaken subject to the budget holder’s formal consent and full budget transfer. Ensure any resource demands for in-house team and contractor are charged to the third party instructing.